After last week's reorganization announcement, we would like to provide an update of the services that continue to be coordinated through the Dean of Studies Office. 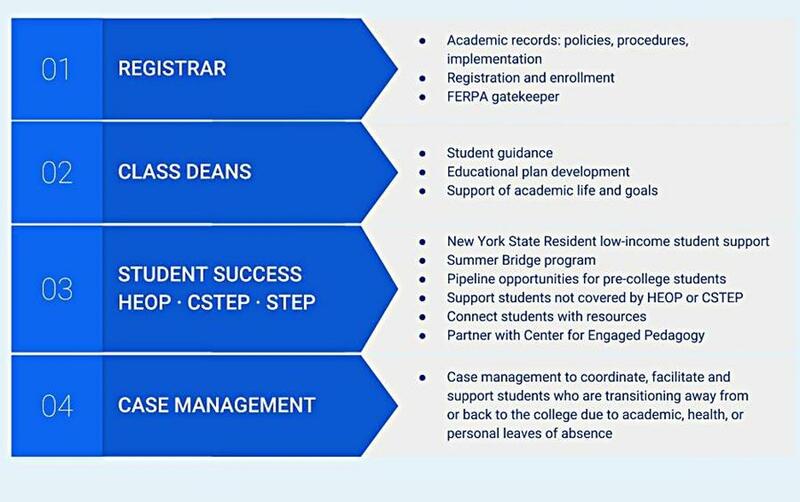 This updated structure allows the Deans and staff even greater opportunities to collaborate with you and the Beyond Barnard team to support our students' time at Barnard. In addition, we would like to share that as part of this reorganization, the Registrar’s Office is now a part of the Dean of Studies Office. We will be working with Registrar Jennifer Simmons and her staff to continue to strengthen the advising and registration processes. Last day to drop a course. Some students may not remember that this cannot be done online and requires them to pick up the form from the Registrar's Office, meet with you and get your signature, and then return the form to the Registrar's office. Students may not drop below 12 credits.